Welcome to October’s series on 31 Ways to Earn Extra Cash Before Christmas. In this series, I’m highlighting simple and legitimate ways you can earn extra cash in the next two months for those of you who could use a little extra cash to help you pay for Christmas — or just for your living expenses if you’re in a tight spot right now. I’ve discovered an interesting (and fun!) way to earn a few Amazon cards — just for getting rid of stuff I don’t need. I use Listia.com to give away my items and receive credits that I can use to “buy” other things that I do want and need such as Amazon gift cards, Chili’s gift cards, and more. Listia is an online auction similar to eBay yet no money is exchanged (unless the winning bidder pays for shipping). Instead, credits are used to win auctions and are received when your auctions have “sold”. If you have something you’d like to list, you would take a photo of it and list it using their auction platform. You’ll choose a category, write a description, and select how long you would like the auction to run (ten days is the max). There’s no cost to list an item and you’ll receive free credits for doing so. You can also receive free credits for offering free shipping, earning badges, and more. If your item ends with a winning bid, you’ll receive the credits for that auction. Once you’ve accumulated a decent amount of credits, you can bid on auctions you’re interested in. The Amazon cards are very popular so I try to find some with a low GIN (Get It Now) price. I’ve won a $5 Amazon card for 2500 credits, but now that Listia is getting more popular I don’t think I’ll find one for that low again. It take about 10-15 minutes to list an auction — basically however long it takes you to photograph your item, upload the picture, and create your listing. The key to listing items on Listia is offering items that cost little or nothing to ship. You’ll want to offer small, lightweight items that can ship with just the cost of a stamp or two, such as CD’s or necklaces. It’s amazing the items people will bid on! I’ve seen MyCokeRewards codes being listed and have started collecting caps myself to create an auction of my own. These codes can then be emailed to the winning bidder, saving you from having to pay shipping costs. Just make sure to include a photo of the caps because there is a rule that no intangible goods can be sold. You can also earn credits by referring your friends. When they successfully list their first auction, you’ll get 500 credits! And they’ll get 100 credits simply by joining. You’re not going to get rich, but Listia is a great way to earn Amazon cards from things you no longer need or can’t use. Then, you can use your Amazon gift cards to purchase Christmas gifts or other things your family needs! Shannon is a blogger at Tethered Mommy. She’s always on the lookout for ways to earn extra money when you’re “tied-up” at home. Looking for more? 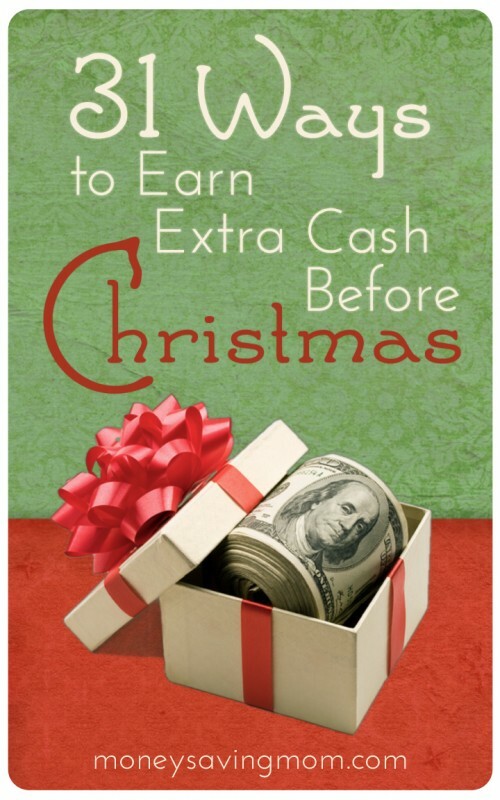 Read more posts about 31 Ways to Earn Extra Cash Before Christmas & guest post. NEAT! Never heard of this! I made sure to sign up under you! 🙂 We have lots of Coke rewards points!! Worth checking out, though it does sound odd. Never heard of it. I searched independent reviews and think I’ll pass. There is not much to hold either purchasers or buyers accountable, EBay is much safer. I’d rather post things like coke codes on established trade boards. For me Listia is addicting!! I have been actively using the site for 9 months. Although the accountability is lower than e-bay, the few, small problems I had with purchasers & buyers were handled by Listia quickly & satisfactorily. I have gotten some wonderful, expensive items: a brand new breast pump with case & accessories for my daughter, many new baby outfits, a Lia Sophia necklace, Wal-mart & Burlington Baby gift cards, new cast iron Cajun skillets, a Coach wallet and much more. E-bay is a better place to make extra $, yet Listia is a great place to pick up new items at deep discount prices (credits)! Listia is great! I’ve been able to post things with really low cost shipping to get credits to then purchase nice gifts for Christmas and birthdays, even coupons for free things now and again. I’m throwing a baby shower in December but have a LOW budget and I’ve been able to get a lot of items for the gift and games – LOVE Listia!! As an RN who works 12-16 hour midnight shifts ever week at 65 years old, any time off is braindead. I’m sure I could do a few of these in this condition. Grin.